It was joy and jubilation when beneficiary schools, medical facilities and development projects received donations in kind from the Danish relief group recently. The goods which included computers, school desks,chairs wheel chairs, hospital beds, side table, linen, uniforms among other essentials was officially handed over to the respective hospitals by the minister of state for provincial affairs Advocate Martin Dinha . DAPP Zimbabwe representative applauded the good relationship that exists between the government of Zimbabwe and DAPP Zimbabwe saying “ Working together has proved to be an effective formula to seeing communities embracing and effectively adopting sustainable development practices” He added that DAPP will continue to support government efforts to deliver lasting development solutions to Zimbabweans living in marginalized areas. 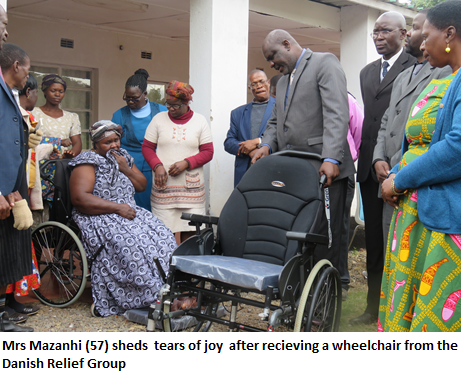 Hospital staff said the medical field in Zimbabwe is currently going through a crisis and donations like this go a long way to ease the suffering of patients. DAPP Zimbabwe project beneficiaries also commended the Danish relief group for providing them with tools to making work more efficient. TC TB project lwader Stailine Majecha said “The Danish relief group is a which has been a key a partner to our development work for many years. This relationship has seen many communities benefiting from their generosity and we are proud to a part of this great initiative.